I was at my local chocolatier's this week and a new chocolatey creation called out to me in a deep, dark, rich and seductive voice. How could I resist such a wondrous way to start September? trhankyou for your comment on my blog. Ahhhhh Chocolate. Last night I had a square of dark ( 70%) choc. that had chilli and choc. nibs in it. Divine. 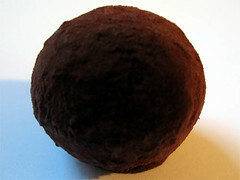 It was probably one of the best chocolate truffles I've ever had. I wish you could have had one. wow. that truffle looks amazing and i'm sure it tasted even better. very nice way to start September!